Week 10 was for the RBs, the best week of the season for fantasy running backs. If your runners didn't show up, you probably weren't a winner. If they did, you may have had one of your top scores of the season. Let's take a look at this week's studs and duds. The biggest passing line of the week came Thursday night as Ben Roethlisberger lit up the Panthers for 328 yards and 5 TDs. Sunday's star was Mitch Trubisky, who added a rushing TD to a trio of passing scores and 355 yards. Andrew Luck, Drew Brees, and Russell Wilson each had 3 passing TDs as well. None of them hit 300 yards passing, but Wilson did add 92 yards on the ground. The whole Patriots offense disappointed, but Tom Brady led the way. He had 254 yards without a score and didn't even finish the game. Andy Dalton didn't finish his game either, and he had only 153 yards and one TD in a presumed shootout against the Saints. Ryan Fitzpatrick rolled up yards but was kept out of the endzone, and Derek Carr was a scoreless bust too. The RBs sure came to play in Week 10! No short of a dozen RBs cracked the 20-point barrier in a loaded week. 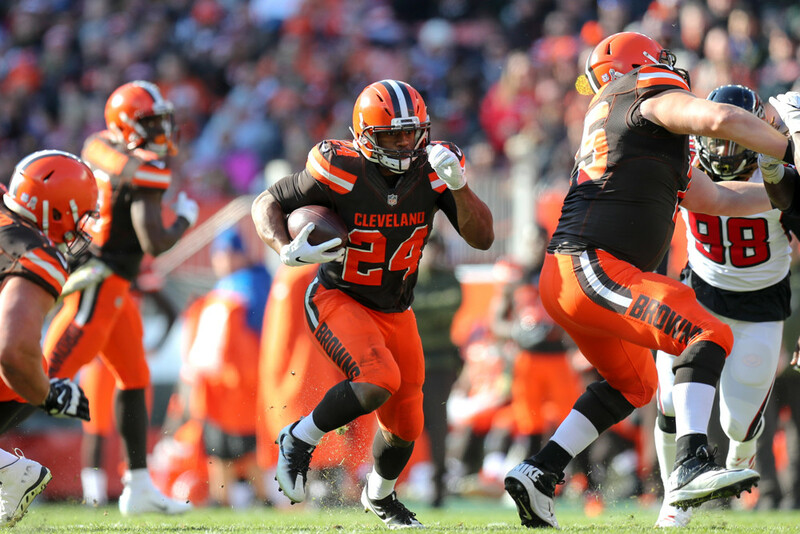 Cleveland rookie Nick Chubb led the way with over 200 combined yards and 2 TDs, including a 92 yard rushing TD on the longest play of the season. Christian McCaffrey was the one Panther who showed up Thursday night with 3 TDs and 138 combined yards. David Johnson and Ezekiel Elliott finally lived up to owners' expectations, each with over 180 combined yards and a pair of scores. Aaron Jones, LeSean McCoy, Leonard Fournette, and Alvin Kamara each had 2 TDs and over 100 combined yards too. Todd Gurley, Melvin Gordon, and Mark Ingram each went over 160 combined yards with a score. Many weeks that might lead the way; in Week 10, it gets only a cursory mention. James White has been a fantasy stud in 2018, but he was a dud this week with only 26 yards. Jordan Howard disappointed with just 11 rushes for 21 yards against Detroit's porous rush defense. Tevin Coleman, Marlon Mack, Kenyan Drake, and Sony Michel all disappointed too, each coming up short of the 50 yard mark and held out of the endzone. It was a RBs week, but four receivers caught two TDs. Allen Robinson led the way with 133 yards and two scores, though technically Tyreek Hill beat him out with 137 yards combined. Michael Thomas and Davante Adams didn't hit 100 yards but did get two scores each. Corey Davis also broke out with 7 catches for 125 yards and a score. Mike Evans was the biggest star dud, with just 3 catches for 51 yards. Jarvis Landry disappointed yet again with only 22 yards against a poor Atlanta defense. Golden Tate had only two catches in his Eagles debut, and Mike Williams didn't even get a target for the Chargers. Week 10 saw two of the best tight end games of the season. Eric Ebron stole the show early with 69 yards and 2 TDs, then added a third TD on the ground. He didn't even last the day as the top fantasy TE as Zach Ertz was a Sunday Night beast. He racked up 14 catches for 145 yards and had 2 TDs too. O.J. Howard and Jimmy Graham have been touchdown dependent at times, and the scores didn't come this week. They each had only one catch for 15 and 14 yards respectively.